Valentine’s Day is a week away…I hope you are getting your plans in place! We have celebrated this special day much the same over many years…a quiet and romantic evening at home complete with a nice dinner and of course a pretty table for two! I know we first think of our husbands or significant other on this holiday of love, but have you ever thought of inviting others to share in that special day? Perhaps a couple that might need encouragement in their marriage or friends that are single and have no significant other? Or maybe even the way our friends, Charles and Kathy did for years…they invited all the widows from our church to their home for Valentine’s dinner. That simple invitation to dinner or even a sweet Valentine card could be exactly what makes a potentially difficult day one of joy for someone! With this in mind, I have set a table for four this week! 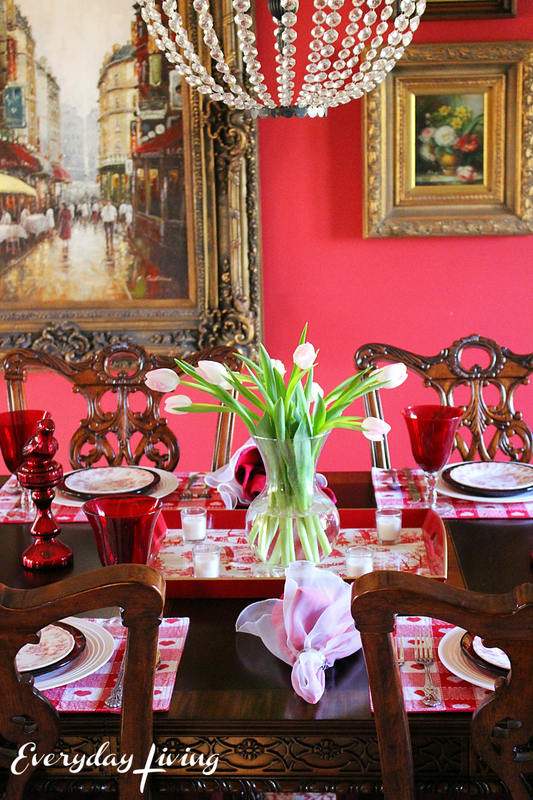 My red dining room is a perfect backdrop for Valentine’s Day! 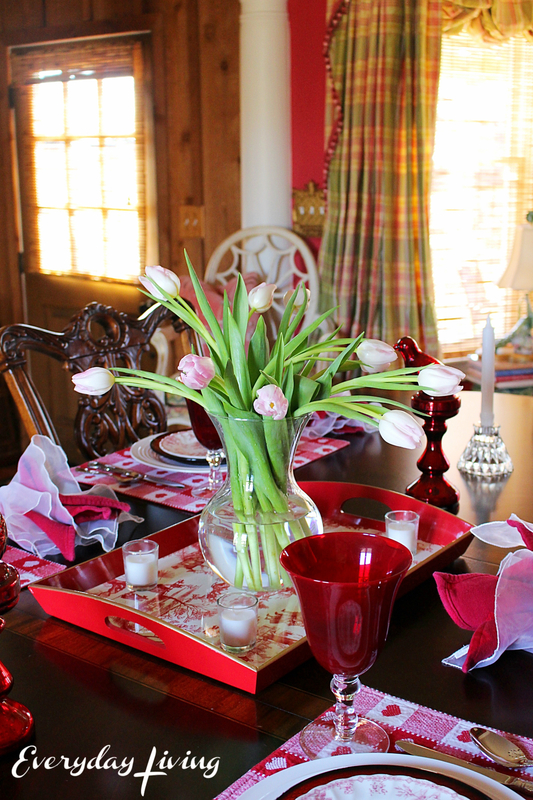 Pink tulips sit in a red toile tray that I found at Tuesday Morning last year. 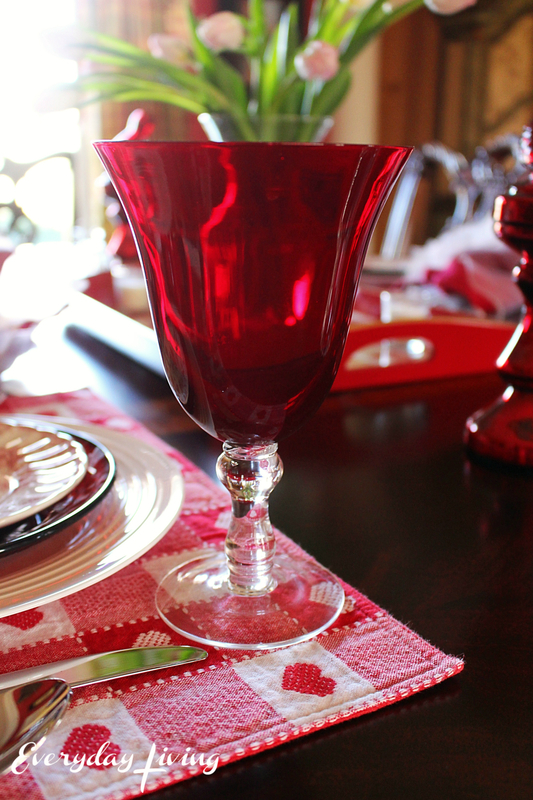 Of course, the red stemware makes an appearance for this special occasion! My everyday white dinner plates, topped by a beautiful cranberry salad plate, and a Churchill toile patterned dessert plate completes the plate stack. A pair of birds given to me by a special friend and crystal candleholders flank the tulips. 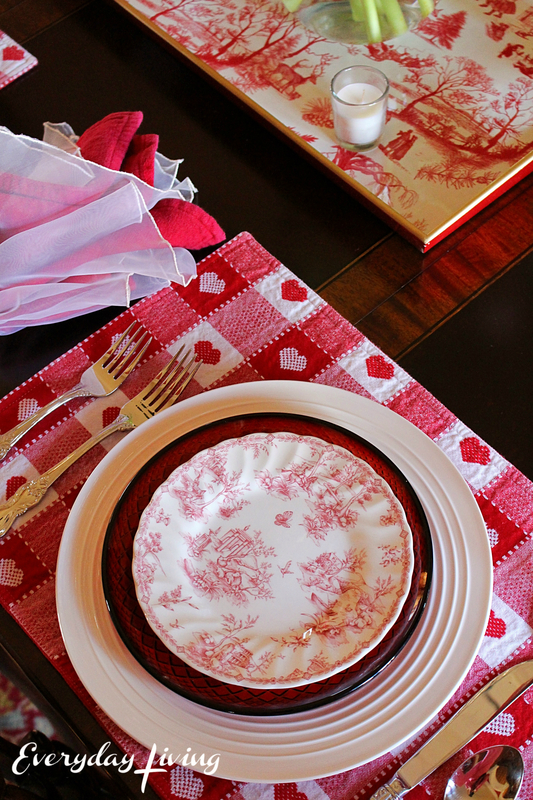 I use the heart placemats every year for Valentine’s…the checks and hearts are too cute! I would normally make red velvet cake (Butch’s favorite) for our Valentine’s dinner, but we decided we would not cheat on our Whole 30 diet plan. We chose a hard month to diet because we also celebrate our anniversary this month. 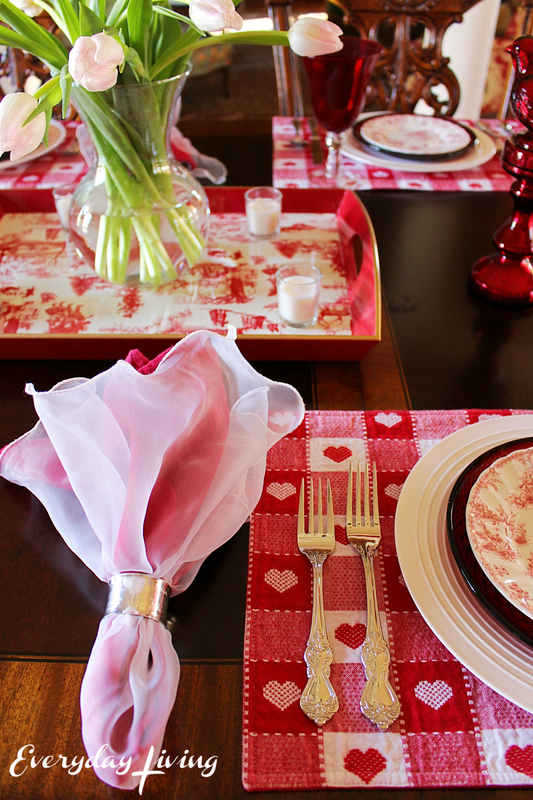 Sheer organza napkins are paired with red ones. How do you celebrate Valentine’s Day? 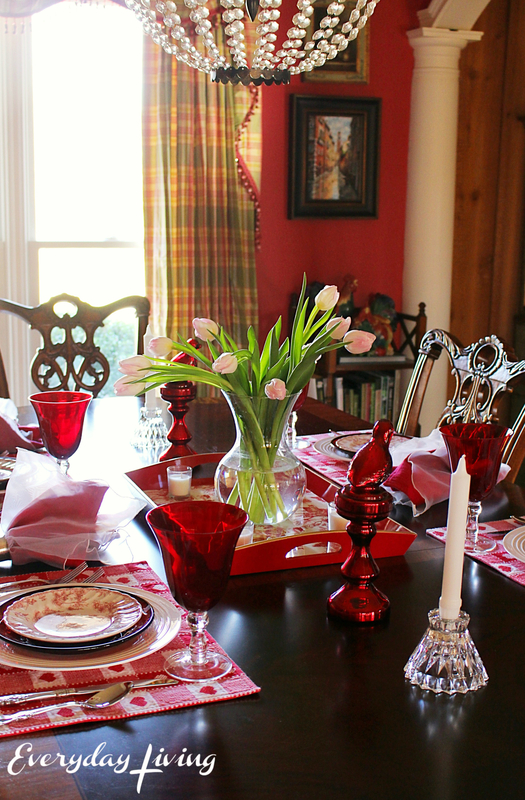 Do you invite family or friends to share dinner at home or a restaurant? Thank you, sweet friends, for your visits and comments you leave behind. So pretty! 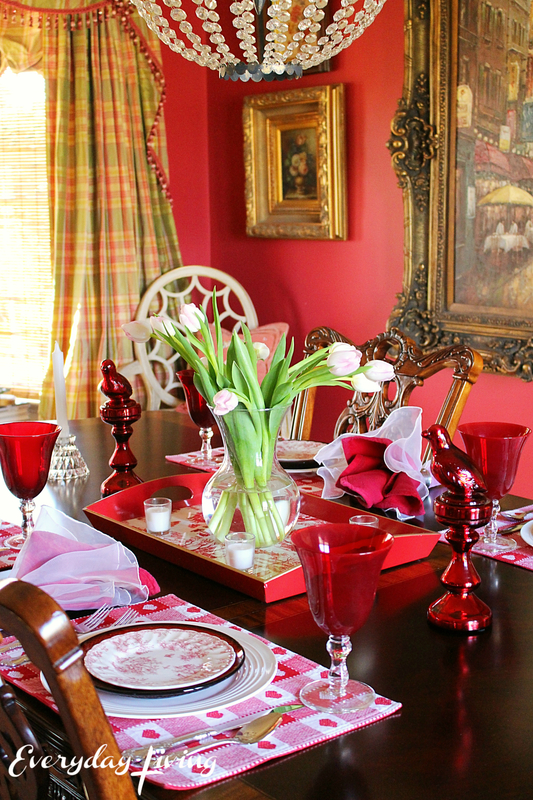 The paint on your dining room walls is perfect for Valentine’s Day! Thanks so much, Karen! Have a wonderful Tuesday! I love the concept of inclusion on Valentine’s Day. There are just too many individual people hurting to isolate them from celebrating love. Speaking of celebrating love, congratulations in the anniversary month to you and Butch, Pam! Enjoy! Thanks so much, Rita…Happy Tuesday! Thanks so much sweet, Jeanie! You do have the perfect dining room for Valentine’s Day Pam! The willowy tulips are so pretty with the red and white. Your thoughts on including others for this day of love are generous and beautiful, share the love! Your table is beautiful, Pam. I love the toile tray, especially with your dessert plates…such a nice repeat. 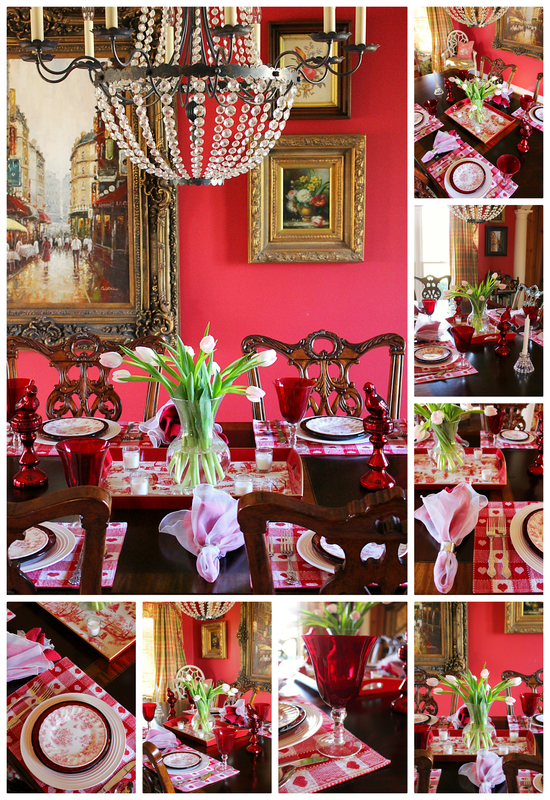 Your dining room is stunning with your additions of red and pink to your table. Love the tulips! Aren’t we all ready for spring?! Thanks so much, Kim! 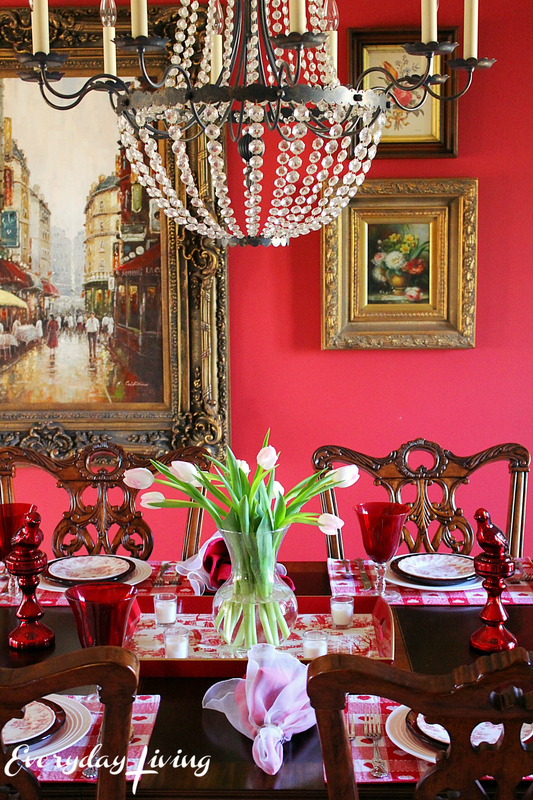 I am contemplating painting my dining room…Happy Tuesday! Years ago I determined it was best to have dinner at home on Valentines. I can’t tell you how relieved the hubby was after a few failed attempts to take me out to dinner. This year should prove to be interesting! Lovely table as always. I think most husbands prefer eating at home for the occasion! So pretty, Pam! Love the tulips in the toile tray and sweet birds as your centerpiece. Your napkins and glassware go so well with the cute placemats. Of course, your plate stack is perfect. Great idea to share the occasion with others. I’m late reading blogs today. I’ve been out in the yard all morning working and I am going to be sore but it felt good to be outside. Thanks Bonnie, it has been pouring rain here all day, it was predicted that we might have severe weather! So far, just heavy rain! Pam, I love your idea of including others on Valentine’s Day. We always have a Valentine Party with our children, I bake goodies, decorate the table, and prepare a special dinner. Then each child, gets a special Valentine’s gift, They look forward to it each year. Your table is beautiful and perfect for a wonderful Valentine’s dinner. I am adoring the red toile plates and those cute birds. I know that your guests will feel special sitting at your gorgeous and gracious table. Shannon, your Valentine’s party with your children is so sweet and the memories you make will be cherished! Love your pretty table Pam. So inviting and perfect for Valentine’s Day. Your dining room has lots of glam and drama. Many blessings to you. Linda, thanks so much! Happy Valentine’s Day to you! Shirley, I would love to come and shop with you…maybe we can make that happen sometime! 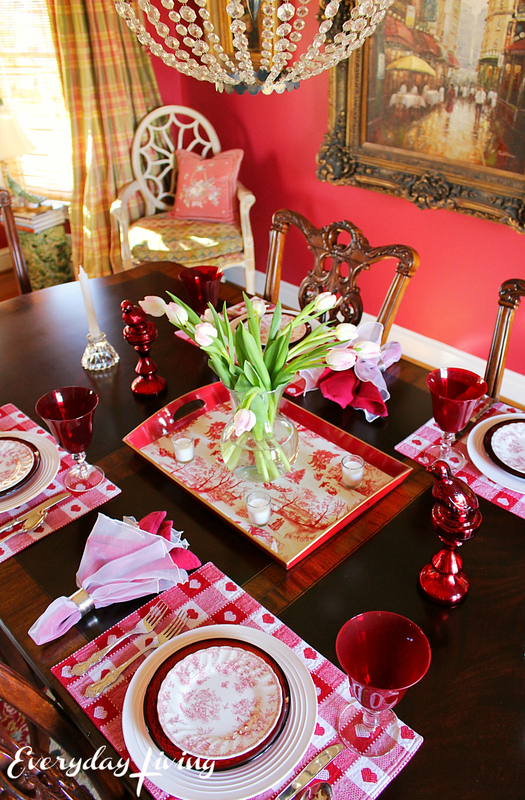 Your dining room is the perfect romantic aback drop for your gorgeous valentines table!! Thai all comes together beautifully for the loving occasion!! Stunning! Beautiful room! I admire all the red. Your table is perfect to celebrate Valentine’s Day! It’s beautiful Pam. 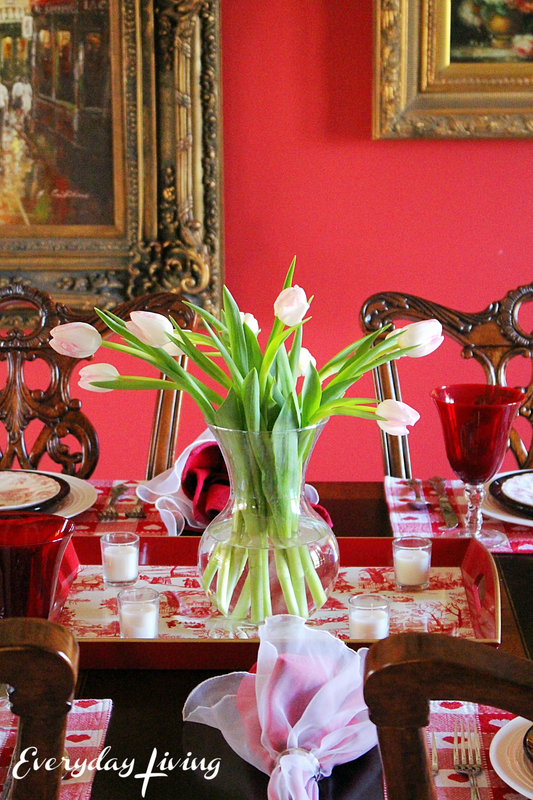 I love the red toile tray! Thanks for sharing with SYC. your table for Valentine’s day is simply perfect, so stunning and cared in the littlest detail, thank you for sharing such Beauty with us, and thank you for the lovely comment you left on -My little old wordl – I appreciate it so so much ! Thanks so much, Daniela…Happy Thursday! Lovely! I love those vintage red glasses. Beautiful table, love the reds, especially the goblets. I used red goblets on my table too. Thanks for sharing. What a beautiful table Pam! Happy Anniversary! I am writing about that exact Proverb 25:11 this week! Thanks for sharing at Home Sweet Home! Sherry, I am loving your writings, so encouraging! From the sheer napkins to the tulips everything is perfect! Thank you for sharing with us this week at Celebrate Your Story, have a great weekend. Thanks so much and have a great week, Sandra! Pam, since I only recently found your blog, visiting your Valentines Day tablescape from last year was an extra sweet treat for me. I love your simplicity but beautiful table. I think we both have the same flatware, Oneida Dover. It is such a pretty and classic design that compliments almost any table. Love so much in this tablescape! I am so glad you found my blog and are following, Linda! Have a wonderful week.